I told myself I will get control over my budding obsession with cream eye shadow…and I will…after this. Chanel has developed its own version of hybrid/cream shadows called Illusion D’Ombre. The color selection is limited, but any makeup obsessed person will find a shade to call their own. Chanel describes the shadow as an intensely shimmering, versatile, long-wear eye shadow with an innovative gel texture that is both soft and cushiony. It can be worn as eye shadow or eyeliner. To me, the texture is a cross between a gel and a French mousse. It feels silky to the touch. The one drawback is that the bit of product I’m trying to put on my brush moves around too much while in the pot. It’s almost like you have to scoop it up. This issue can be avoided if you use your fingers, but I’m not a big fan of that. I found that I didn’t pick up enough color when using my finger, but that method is the way to go if you’re looking for a sheer wash of color. The shadow comes with a small, cute, angled, synthetic brush that actually applies this product nicely onto your lid or lash line. Given the maker of this product, the price tag shouldn’t be a surprise…$36 for 4 grams of product, including the brush. Ébloui is a red tinged brown with multi-colored sparkles that is easier to see when the product is brand new. 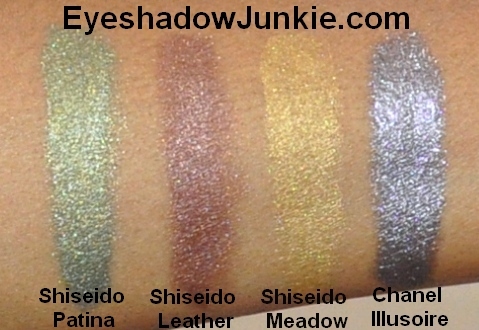 The swatch photo of the product unused is a bit deceiving because the shadow is lighter in color in the once you begin to use it. It seems the shimmer gets infused with the rest of the color and reflects off the light. The brown tones in the product get lost on my skin but the reddish pink tones shines through beautifully. An arm swatch (#4) can be found here. (An arm swatch of Illusoire can be found here (#4). I applied Nars primer with my finger all over my lid and up to my brow. I applied a deep burgundy paint pot with a Sigma flat lay down brush on my lid just past my skin fold. I used the paint pot to help the color show up for pictures, but the Ébloui looks great without it. With a Louise Young LY38, I blended Moleskin (a skin tone shade) into my crease. Using the small synthetic brush that came with the shadow, I applied Ébloui on to my lid and blended it into my crease shade. I also applied this color to my lower lash line. To define my outer corner, I used a Louise Young LY13 and a black shadow to lay down the color. I blended the black into the lid shade and crease with a blending brush. I chose a pale gold shade for my inner corner and my favorite (and only) black gel liner for my upper and lower lash line.